One of the great advantages of multimedia is its information density. Through the use of video, audio, graphics and photos, you can tell a complex story both effectively and succinctly. The War Without Borders: Fueling Mexico’s Drug Trade (Warning: Contains graphic, violent images) is just such an example. The NY Times reporters expertly tell the story of how Americans are fueling both sides of the drug war through the purchase of illegal drugs and the subsidization of the war on drugs, packing a full-documentary worth of material into a nine-minute presentation. Graphics tell the story of the flow of drugs from Mexico into the U.S. and of guns from the U.S. into Mexico. 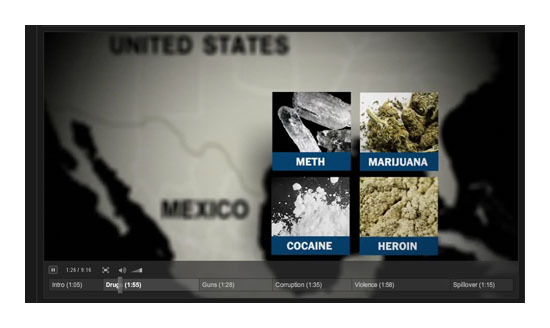 A video interview with Rafael Reyes, Chief of Operations for Mexico and Central America for the DEA articulates the problems for law enforcement officers and links at the bottom of the page provide access to additional information. This way, the entire package is evergreen, the multimedia presentation provides the executive summary of the topic and the related links flesh out the details and current developments within the story. The NY Times should be applauded for pioneering new methods of presenting and distributing news despite the dire economic forecasts. I hope that outstanding journalism, presented visually, will make for a viable business model for newspapers in the Internet age.